1 5th Anniversary “Winter Quarters” Camp and Celebrations – June 12th–14th. 6 Seymour Alternative Farming Expo 19th – 21st Feb.
9 Council of Muzzleloaders and Black Powder Shooters Victoria Inc. 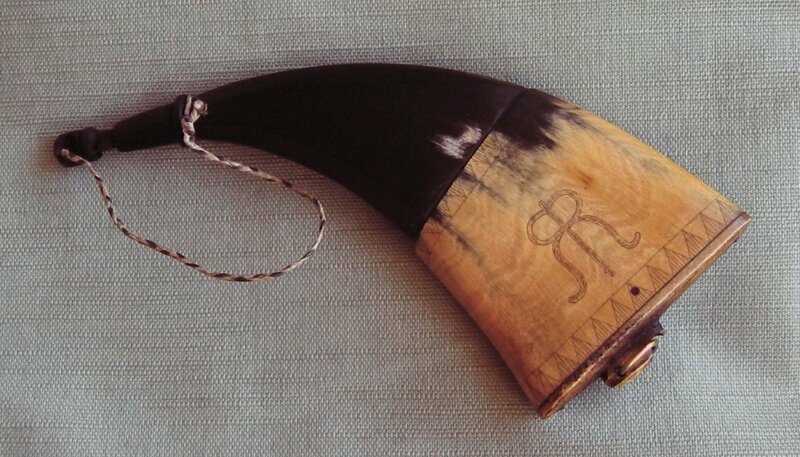 Win this priming horn by Orville Mumma of Jonestown, Pennsylvania. You’ll pass many trade blankets before snagging a priming horn like this beauty – Come to Winter Quarters! 5th Anniversary “Winter Quarters” Camp and Celebrations – June 12th–14th. Queen’s Birthday long weekend – Come to Winter Quarters at Bernard’s Cache. Hail or shine, we intend to celebrate in grand style for this 5th anniversary of our successful Primitive events in the central Highlands. Of all the many great camping spots our State has to offer, you won’t find a more pleasantly secluded area with abundant firewood, or a sweeter mountain stream, with a billion stars around the Southern Cross at night. A place where pre 1840 times just seem to stand still! (Even though you may be a member of Jim’s class learning to tell the time by the position of the Southern Cross). 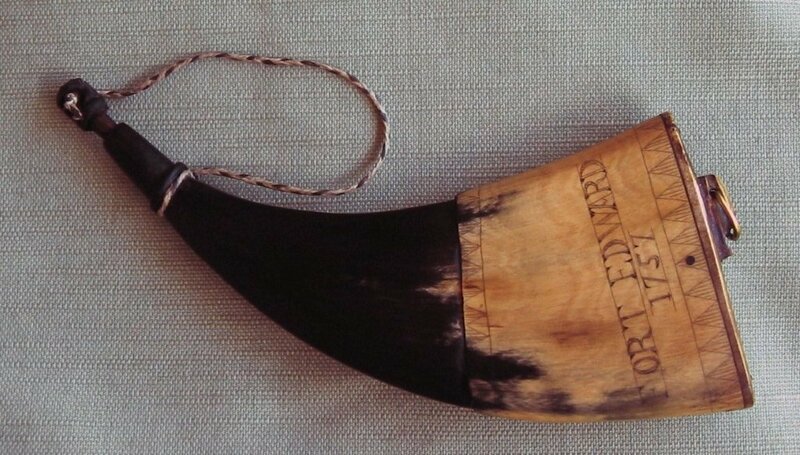 The above featured priming horn handcrafted by noted horner, Orville Mumma of Jonestown Pennsylvania, will be won by one lucky Trapper at Winter Quarters. Our Club has been extremely fortunate in receiving additional support from a couple of members and several well-wishing wonderful friends. I’m talking about some very welcome unsolicited dollars and other very desirable goodies to either raffle or to award as prizes for shooting prowess. And yet we have been promised more to come! It is so encouraging to receive such magnificent support for dedicated Primitive Rendezvous. In Volume 22 we thanked Bob Seip, Bob Timms, the Collinson’s and the Wilson’s and now I should also mention generous gifts from members Justin & Louise Fletcher and from Glen Mitchell. Also, we are again indebted to Noel Collinson and I have kept for last a very special “thank you” to Orville (Spark) Mumma of Jonestown, Pennsylvania. Courtesy of both Noel and Orville we can offer a most desirable prize of the exquisite priming horn made by Orville who is a member of The American Guild of Horn Workers. Orville has asked that the horn be won in a shooting match and this is planned for our Winter Quarters camp. I suspect there may be a small entry fee or wager attached to add further excitement to expected very keen challenges. We will also be raffling a nice voyager cap with a small sterling silver Celtic blanket pin. Our Club was born out of a Winter Quarters camp at Highlands/Caveat and your Committee believe these quality prizes are handsomely suitable in recognition of the 5th Anniversary of that great adventure. We have been offered another very desirable shooting prize which may be available at Beaver Creek in September along with raffling off Glen’s ram’s head fire poker. Our traditional turkey plate and basket of harvest vegetables prize will be challenge for any hungry Longhunters. A vegetable in the basket is the entry fee, and no, sorry girls, veggie husbands are not an acceptable entry fee, but lady shooters are definitely welcome. Everyone is a winner at our rondyvoos – come along for the fun and join the winners! Can’t make it to Winter Quarters? That’s tough, really most unfortunate, but you can still enter our raffles; simply forward some gold (or a cheque) to Club treasurer Murray. Voyager cap/silver blanket pin will be drawn at Winter Quarters. Tickets $2 ea or 6 for $10. Enter today and good luck to all who enter. Don’t miss out, post your cheque or money order to Murray now at 2806 Colac/Ballarat Road, Dereel 3352. Need directions to Beaver Creek or Bernard’s Cache rendezvous sites? Contact any Committee member for detailed guidance. July 10th. The 21st Eureka Militaria & Collectable Fair. Norman St. Ballarat. We’ll be attending a display table sponsored by the Victorian Council of Muzzleloaders and Black Powder Shooters. 9am-3.30pm. Free entry if fully attired as 18th C militia or close representation. September 17th – 20th. Spring Rendezvous with friends at Beaver Creek, Whorouly. An extended single weekend – Friday 17th through to Monday 20th. Everybody’s favourite Primitive encampment. Plan now to take those few extra days of extended leave to make a thoroughly worthwhile fantastic four day holiday event. November 6th & 7th. Melbourne Medieval Fayre and Tourney (MMFAT) at Berwick. A dedicated Free Trapper / Longhunter 2 day static display amid other all-era re-enactors. In conjunction with Bojo Products wagon and tents. 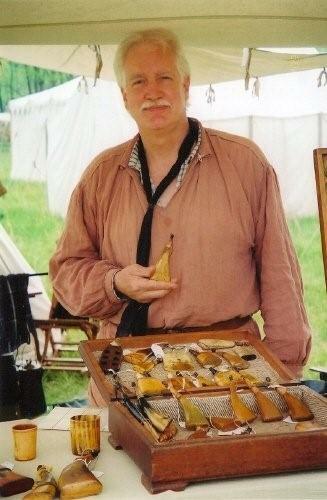 Open to the general public and a fantastic opportunity to advertise our black powder hobbies. No way! His sign was all Apache and he was long ways from any shining mountains. Whilst down in Melbourne town’s outer eastern suburbs recently, I had an unexpected pleasure, meeting up with a genuine Native American Indian. (a very rare occurrence here in Australia) He was visiting my long-time friend, Lionel Jessup, in his leather craft shop (you can smell that a mile away) and I was quickly introduced. His name is Red Horse and he has taken an Aussie gal, from our state’s north-east parts no less, for his squaw. Red Horse already knew about us, as Lionel had slipped him a couple of our past newsletters. 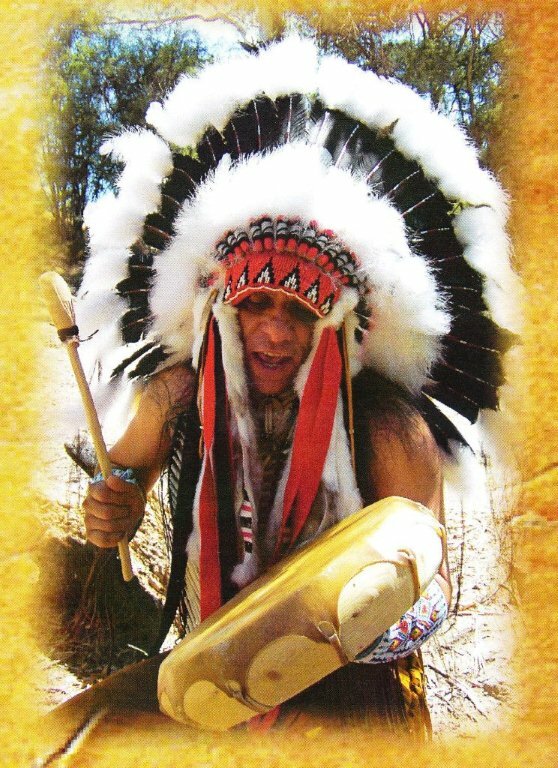 He explained that he was bringing a little of American Indian culture to our primary school kids via lectures, artefact exhibits in his display tipi, along with song and dance. I was rather chuffed to receive a personal one-on-one mini education session whilst being allowed to examine a pair of finely beaded moccasins, beaded knife sheath, a talking stick, peace pipe, dance rattle, beads, turquoise jewellery, foofaraw and such! You can bet that I extended a hearty welcome to visit and camp with us along with his wife, Natalia, and family. It is hoped that they may find some time from busy schedules to relax and join with us at Rondyvoo. The picture below is taken from Red Horse’s Primary School Presentation brochure. Meanwhile, our Trapper parents could be pushing their school committees to engage Red Horse’s travelling exhibition. Red Horse of the Mescalero Apache. Rendezvous Sketches! Club President Ian Convey demonstrates it’s not all shooting, trapping, skinning or telling lies across trade blankets. Ian enjoys relaxing moments doodling with sketch book and pencil. You might say he’s following the footsteps of noted artist Alfred Jacob Miller, the first and only artist to attend an original rendezvous way back in 1837. Drawings and etchings were used to illustrate books and newspapers, or to decorate homes, cabins and tipi’s, also guns and powder horns. 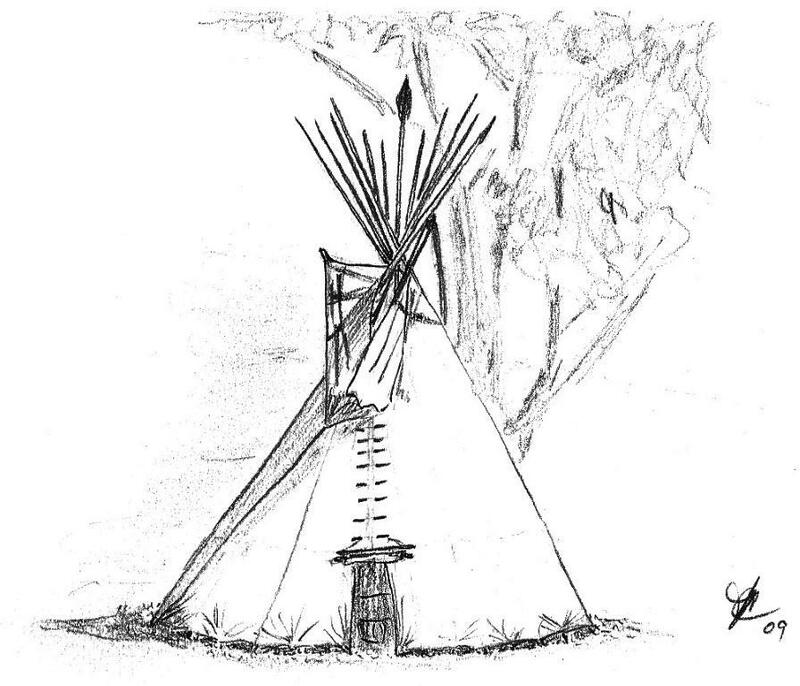 Tipi and trees at Beaver Creek 2009; pencil drawing by Ian Convey. Seymour Alternative Farming Expo 19th – 21st Feb. This was our second appearance at this annual expo. Again we utilised Bob Ellis’s Bojo tents to good advantage housing an even better display of Trapper paraphernalia than we managed last year. We gained one new member and lots of praise and encouraging feedback from the public. Even the local constabulary were impressed. Thanks to Bob, Jim, Glen & Anthea, Paul and Ron who all took many enquiries. The shooting sports are not often favoured with good publicity, so the Expo is a great opportunity to show a fascinated public a friendly alternative hobby and outdoor pastime. We can be very proud that SCFT members are leading by example. Members please note – All subs for 2010-2011 were due by 31st March. If you’ve overlooked payment please forward a cheque or money order to Murray Convey ASAP. Thanks for co-operating! Treasurer – Murray Convey, 2806 Colac / Ballarat Road, Dereel 3352. To win our featured priming horn at Winter Quarters, you will need a number of the everyday woods skills that were commonly developed by Rangers, and indeed, just about everyone who wished to survive on an unforgiving frontier. You will also need a little luck but the odds should be fairly good! The Committee has devised a very interesting test of 1750’s era survival skills to challenge all members. Well, don’t ya wanna have fun no more? Council of Muzzleloaders and Black Powder Shooters Victoria Inc.
As reported in 2009 (Vol. 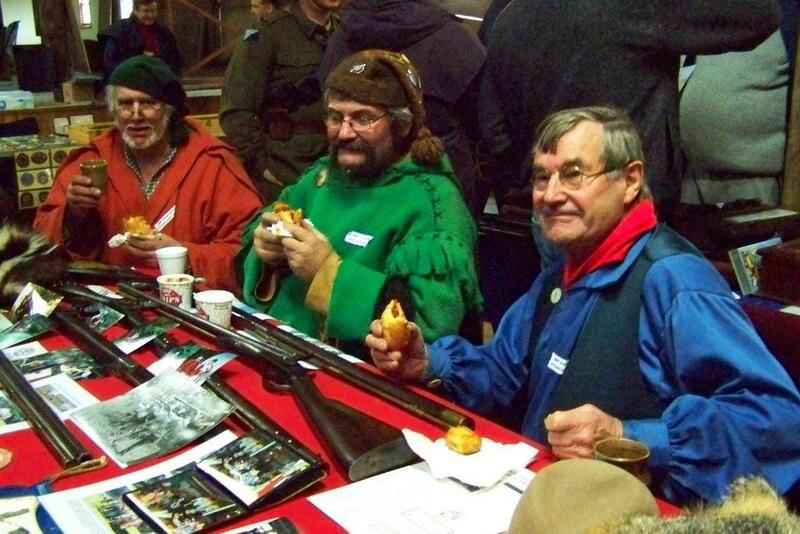 15) The Free Trappers accepted the invite to join forces with the Council of Muzzleloaders. 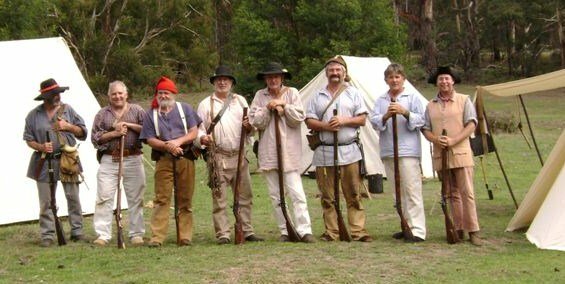 Delegates from Seymour Black Powder Club, Western Districts Muzzleloaders and the Free Trappers meet a couple of times a year to discuss ways to enhance our sport, membership growth, any proposed firearms legislation changes or any other relevant firearms/ sport / political issues. Chook, Murray and Jim grab a bite; Ballarat Gun Show 2009. Our input to date has been to revitalise Council meetings and instigate a group display at several gun shows. Members of all three Clubs have manned tables at both the Ballarat (see our report Vol 19, Sept 2009) and Bendigo Gun Shows. The Council plans to repeat these promotions in 2010 and have already booked a table at the 21st Eureka Militaria and Collectable Fair (aka Ballarat Gun Show) for July 10th. SCFT members are encouraged to attend wearing full costume if possible. 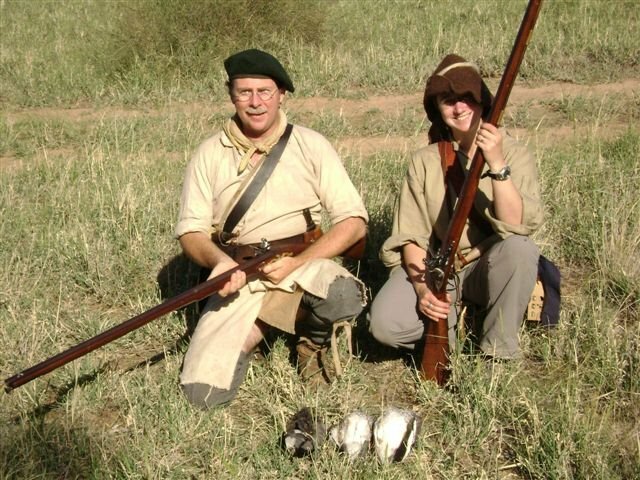 We do feel we are experiencing a general resurgence of interest in the black powder sports – Be part of it and help keep the momentum happening! Hunting Around: “We had success on Opening day morning using our flinters to take three Wood duck. Katherine was using Jeff’s smooth bore, a Pedersoli 20 gauge trade gun, loaded with 70 grains of powder and 1¼ oz of No 4 shot. I shot with “Precious” (my Green River Rifle Works 12 Gauge) loaded with the same charge. Two of these plump Woodies have already been carved up and consumed as mouth-watering schnitzels; the third is stowed in the freezer. See you all round the traps.” Le Reynard. Le Reynard and Grizelda on opening morning with three Wood duck. Nine Buckskinners and two young lads made the most of the superb camping weather. With no sign of rain, just warm sunny days and lovely cool starry evenings, the time passed most leisurely. Lisa, the lone lady ’skinner in camp was obviously enjoying the camp atmosphere, socialising and allowing two small boys the freedom of the Painted Pony plains. The hunters took daily strolls about the bush, inspired by the nightly roaring of Red stags from the nearby deer farm, while our dedicated plinkers shot numerous holes through life-size animal woodcuts. Oh, with one or two misses! A Sunday highlight was the team stake shoot, with Murray’s team chipping away at their stake from both edges. Meanwhile, Ron’s team needed time to get their eye in, but eventually cut a hole in the centre of their target. With only splinters of timber holding both stakes intact, it was touch and go who would win, when Ronnie, loading his last 10 grains of FFFg in that shortened canoe gun, squeezed off a “phut” that won the day. Both teams then blasted the remaining stake, relishing the pure fun of shooting. The evenings were spent around a convivial campfire sharing a horn cup of Muscat, short stories and tall, a few jokes and even some fine singing led by Ian. Hosts Bernie and Judy called-by to share our coals for baking a magnificent traditional style damper which we all enjoyed topped with Judy’s homemade Blackberry jam. Thanks go to Jim for cutting up an ample supply of firewood, and to Bernie and Judy for usual hospitality extended.